The WKL Series is the advanced system of choice for standard applications ranging from under 100 to 2000 cubic feet. WKL Series systems are compact, self-contained units. Their performance speaks for itself. This series is equipped with the BREEZAIRE's affordable Sentry III control system. This system offers more features that others offer in their higher-grade models. Accurate, easy to adjust temperature set points with continuous display of cabinet temperature. 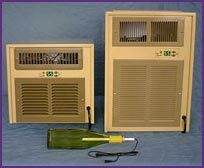 Blocked airflow protection, which shuts down unit and protects wine in case of high temperatures caused by condenser blockage or fan failure. Controls temperature by enclosure (cellar) air sensors or optional bottle probe. The ideal temperature for storing and aging wine is between 50° and 60° Fahrenheit. Each BREEZAIRE system includes an adjustable thermostat that makes it possible for the user to precisely control the conditions in the wine cellar. When initially bringing the temperature down to the desired level and in maintaining the target temperature, the system produces a gentle stream of cool air - never a blast of cold air that could subject the wine to abrupt temperature changes. All BREEZAIRE systems are engineered to be vibration free, hand assembled, and tested to ensure that they meet the most exacting standards. The elimination of vibration levels that may be undetectable to the owner results in wines that have greater clarity and brilliance. BREEZAIRE systems perform their task quietly and unobtrusively to preserve the atmosphere of isolation from the outside world that makes a visit to a wine cellar an unique experience. An attractive metal cabinet that blends in with the d1/2©cor of your cellar area and can be flush mounted to any wall. BREEZAIRE's most popular systems are completely self-contained modules that are simply mounted in a wall and connected to a standard 115V AC source. No plumbing, complicated wiring or special procedures including the on-site installation of refrigerant are required. All BREEZAIRE systems are designed to deliver superior performance. Constructed using only the highest quality components, and hand assembly by skilled craftsmen in BREEZAIRE's U.S. production facilities. Owners enjoy the security of warranty coverage that reflects BREEZAIRE's high standards. Support in the form of expertise in system selection, enclosure design, and problem solving in the highly specialized area of creating and maintaining an ideal environment for delicate products. Enclosure Volume Up to 2000 Cu. Ft.